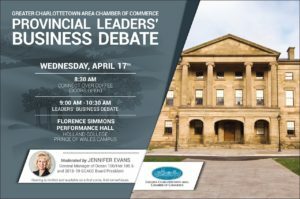 The Greater Charlottetown Area Chamber of Commerce invites its members and the public to attend a Provincial Leaders’ Business Debate on Wednesday, April 17th from 9:00 a.m. to 10:30 a.m. at the Florence Simmons Performance Hall on the Holland College Prince of Wales Campus. The event is open to the public and free to attend. No registration is required, however, seating is limited and will be available on a first-come first served basis. The doors open at 8:30 a.m. to allow attendees a chance to connect over coffee before the debate. Jennifer Evans, President of the Chamber Board of Directors and General Manager of Ocean 100/Hot 105.5, will moderate the discussion. Topics to be presented to leaders will include a competitive tax environment, workforce development, regional economic development and economic vision and planning. On Tuesday, April 23rd, Islanders will go to the polls and vote for their next provincial government. For more information on how to vote, or to register, visit electionspei.ca.